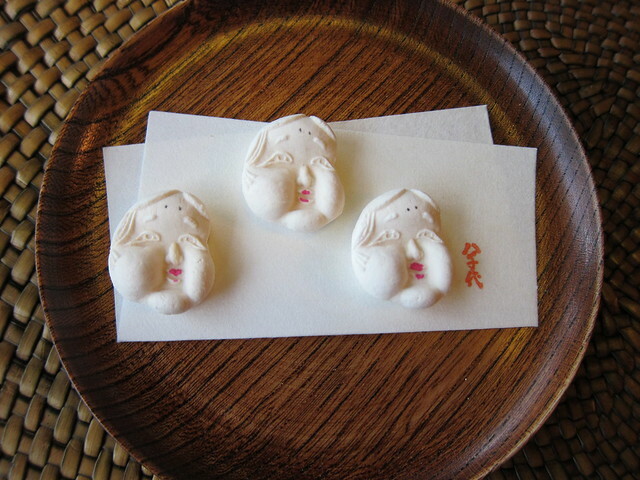 Wagashi are traditional Japanese sweets. They are generally extremely fancy and beautiful, each one a little work of art. Traditionally, wagashi are used mainly for the Japanese tea ceremony as well as for festivals, special occasions, and temple ceremonies. There are also wagashi eaten as everyday treats, but those are generally more simply designed and colored. Tea ceremony wagashi can be classified overall as either ‘dry sweets’ or ‘moist sweets’. Dry sweets are quite small (about the size of half pinky finger) and usually crunchy. They come in imaginative shapes and colors. Moist wagashi are about the size of a golf ball and basically round. They are molded or carved into hundreds of gorgeous designs. These wagashi can be sub-divided into many categories- so many that I never really learned all the different classifications. Usually each wagashi has a name. Moist sweets are the main ‘food’ during most tea ceremonies, eaten to accompany matcha tea, much like westerners eat cake with coffee or biscuits with tea. Wagashi’s sweetness offsets the very strong, bitter taste of matcha- powdered green tea- which is served during tea ceremony. Unlike other teas, matcha is tea powder make from super finely-ground tea leaves. 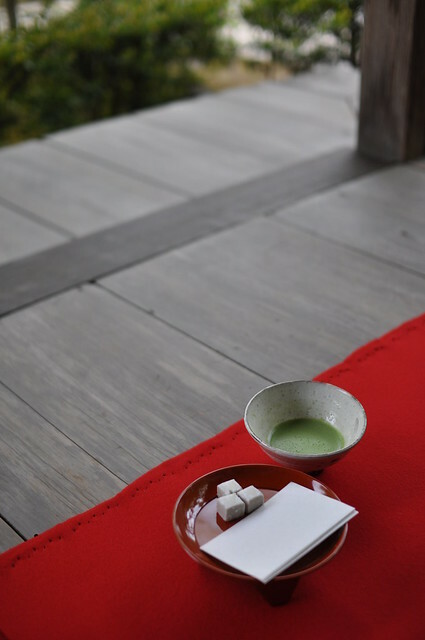 During tea ceremony, matcha is diluted in hot water, then whisked into a thick bright green drink, topped by froth. The tea leaves are actually ingested- a quite powerful taste, aroma, and caffeine boost! Wagashi are often designed for different seasons, like all Japanese cuisine. There are special spring, summer, autumn and winter wagashi. There are also particular wagashi for New Year’s, Cherry Blossom Viewing, and other traditional annual festivals. 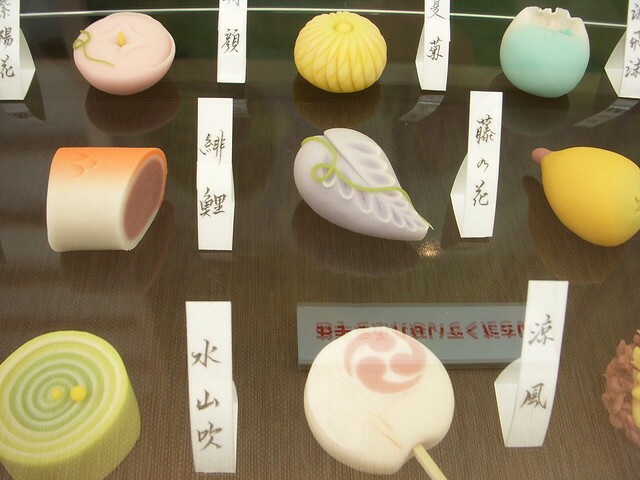 Seasonal wagashi vary greatly in colors and designs. For example, in autumn chrysanthemum shapes are favored. Spring wagashi often come in the shape of a plum flower. Famous wagashi for Cherry Blossom Season actually use cherry blossoms and leaves for flavoring and design. Moist wagashi are mostly made from very fine rice flour, various bean pastes, and super-fine sugar, but others are made mostly with agar-agar, a type of jelly. The fine rice flour creates a super-finely-textured sticky dough that is soft and smooth as silk. 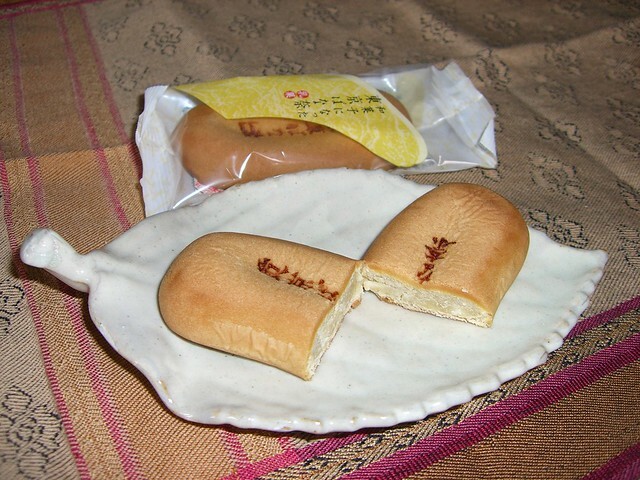 For most wagashi, this dough is raw rather than cooked. White, yellow, green and red bean pastes are used for fillings or to make entire wagashi. The bean pastes come in many different textures, from super fine textured through to very chunky. Pumpkin, water chestnut paste, sweet potatoes, powdered green tea, seaweed, and some exclusively Japanese plants are often used as fillings, coloring, and flavorings. Wagashi come in all colors of the rainbow. Many are white on the outside (the rice flour dough) and filled with some sort of bean paste. Wagashi that are made entirely of red bean paste are a dark purplish-red color. But wagashi made entirely of fine white or yellow bean paste come in all sorts of colors: white, pale pink, bright pink, shades of green, shades of yellow, lavendar, and pale blue. Agar-agar wagashi also come in all colors of the rainbow, and are distinguished by their transparency, just like jelly or jello. There are also baked varieties of wagashi, with a golden-baked outer shell and filled with bean paste, sweet potato, chestnut, or pumpkin. Other wagashi types are steamed. Oh, so many varieties! During Japanese tea ceremony, which proceeds in a regimented order, guests are seated in a tidy line beside each other on the tatami mat. Usually they wear kimono. If both dry and moist sweets are included, dry sweets are served first. A plate or tray of dry sweets is passed down the line to each guest in turn. Each person selects one and places it on her tea ceremony paper. (which she’s brought along herself, tucked inside the obi of her kimono). Next, the moist cakes are passed down the line. Using chopsticks, in a very particular manner, each guest selects one wagashi and places it on her paper. Guests are allowed to start eating their sweets as soon as they serve themselves and generally eat before the tea arrives. Wagashi are sold at special counters at most department stores’ huge basement food departments and at tea ceremony specialty shops. If you visit Japan, take time to go admire Japan’s spectacular wagashi on display at any Japanese department store or specialty tea shop. Even better, if you have the opportunity, join a tea ceremony! Some temples, festivals, groups, and tea ceremony schools invite foreign visitors to experience a tea ceremony. Don’t be nervous: you won’t have to wear a kimono or have previous training. They just want you to experience their unique, intriguing traditional art form, their delicious wagashi, and their zingy matcha tea. Lash is an expat American adventurer who’s been out roaming the world nomadically since 1998, mostly in Asia. Prior to that, she lived in Kyoto, Japan for six years, where she studied many traditional Japanese cultural arts, including tea ceremony, wearing kimono, flower arrangement, and koto (13-string floor harp). Lash shares her 14+ years of world travels on LashWorldTour, where she offers cultural insights, travel tips, tales of adventure, and photo galleries from her ongoing travels. An outdoor enthusiast, Lash recently wrote 2 guidebooks to Bali: Cycling in Bali and Hiking in Bali, both available in print on Amazon and in 3 eBook formats on LashWorldTour. They look so pretty that its quite heartbreaking to eat them! ilLido Celebrates its Official Opening!